Why do I need to change my encryption type? In early 2015, there was an update to the FileZilla FTP client that changed the default encryption type from "use only plain FTP (insecure)" to "explicit FTP over TLS is available". 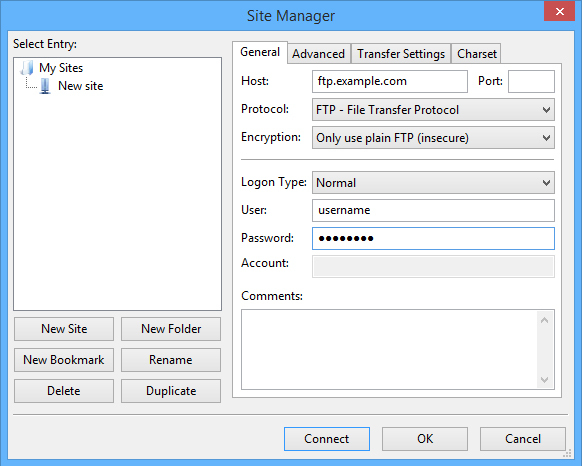 While this was done to make FTP connections more secure, many FTP sites do not support this more secure level of encryption and you will not be able to connect to these sites using the default settings in FileZilla. If you are unable to connect to a FTP site by entering the Quickconnect bar, you may need to go into the Site Manager to change the encryption type. To open the Site Manager, click on the server icon outlined in red below. Enter your connection information in the Host, User, and Password fields. Change the Encryption to Only use plain FTP (insecure) and change the Logon Type to Normal. You should be able to connect to your FTP site now. If you continue to have problems, please contact the Support Team.